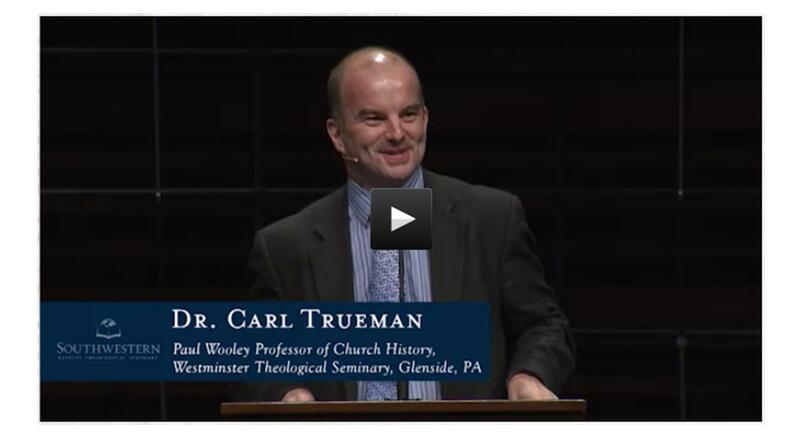 Dr. Carl Trueman speaks in the SWBTS chapel Thursday, October 9, 2014. Yes, you heard that right. Dr. Carl Trueman was invited to speak in the chapel service at Southwestern Baptist Theological Seminary in Fort Worth, Texas yesterday. Seminary President Paige Patterson introduced Dr. Trueman as “my favorite Calvinist” for his activities as a “critic of the culture.” In the video of Dr. Trueman’s chapel sermon, you can see his friendly response in which he expresses his admiration for Dr. Patterson’s role in leading Southwestern and the SBC back to a more conservative theological position. Then he delivers a sermon on the advent of the prophet Elijah from 1 Kings 17:1-24 and proclaims the power of not only God’s Word, but also his holiness, his mercy and his power over death. My pastor, Joe Troutman, and I attended the service, got a bite to eat off campus while Dr. Patterson and his wife hosted Dr. Trueman for lunch (oh, to be a fly on the wall of that conversation! ), gave him a tour of the campus, after which Mid-Cities Presbyterian Church officially took possession of him in preparation for tonight’s OPC DFW Reformation Conference 2014 on the role of creeds and confessions in the Protestant Reformation and their benefit to the life and worship of the church today. If you haven’t already registered, it’s not too late. Pictures and audio to follow on this blog in the coming days. Didn’t Paige Patterson endorse “The Other Side of Calvinism”? If so, I think Truman should have turned down the invitation. I guess even Dr. Trueman believes you can win more friends with honey than vinegar. Is The Other Side of Calvinism the title by Lawrence Vance? I read that years ago, and, yeah, a man of Dr. Patterson’s status ought to know better than to endorse any book by any Ruckmanite. Sometimes these big movers and shakers don’t even read thoroughly enough, if at all, some of the books that they endorse. Sometimes, however, an author or publisher will pull something a Dr. Patterson says about his book out of context to make it look like an endorsement when it really wasn’t intended to be such. But, given the Ruckmanism of Vance, I don’t see why he’d care to promote anything a member of the so-called Alexandrian Cult like Dr. Patterson would say about his book, unless it was scathingly negative. So, we’re back to the prospect of a case of colossally bad judgment on the part of Dr. Trueman’s recent gracious host at SWBTS. Which then makes Dr. Trueman’s acceptance of his invitation that much more gracious. OK, I was wrong. I remembered the name of the book I was thinking of: The Cultish Side of Calvinism by Coate. Patterson’s endorsement is on the dust jacket. From what I’ve read of the book, it makes me seriously question the integrity of Patterson. Alright, that was the one I heard James White review on his podcast much more recently than Vance’s book. Although Coate may be no Ruckmanite, White’s review certainly made Coate’s scholarship sound like it was on par with Vance’s. I heard that episode, also. I mixed up the books. When I heard the podcast I was wondering what Patterson would be thinking endorsing a book like that.